There, I said it. Even though it says in nearly every history book about the Club beginning life at Brockville, moving around several local grounds, before finally returning to Brockville in the mid 1880s. In a previous post about Falkirk's first home game I brought up how the match report stated the match was played at 'Campfield' and this brought up some quesions, but felt it was probably the same piece of ground as Brockville. Well I decided to look into it a bit further, so looking for references to Campfield in the Falkirk Herald in 1877 I came across several interesting bits & pieces which have caused me to question my previous thinking. 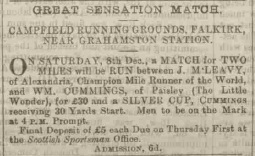 This running match puts sporting competitions in a vague geographical context, however as many of you will know Brockville Park was close to Grahamston Station, so I had to try to avoid sports and look for Campfield in the wider context of Falkirk/Grahamston and quickly came up with some more references. 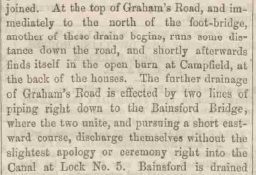 This mentions the drain flowing into a burn behind the houses on Graham's Road, this is not so close to Brockville Park, but still there was open land behind the housing on both sides of Graham's Road, so it was not inconceivable that a very large area was known as Campfield. 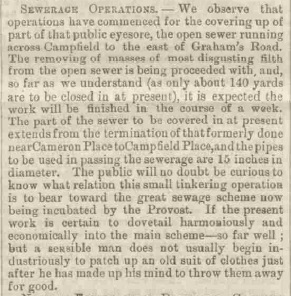 However, a couple of weeks later [still in September 1877] in a report on the beginning of public works on these sewerages locates Campfield more firmly. "... Campfield to the east of Graham's Road". This is pretty definitive, Brockville Park, by any definition was to the west of Grahams Road [the road has lost the apostrophe through time], the place referred to in the Falkirk Herald as 'Campfield' was not Brockville Park. Whether or not there was a mistake in the contemporary report I cannot say, but I doubt it. Soon after the land was bought and the Springfield Foundry was built along with a great number of railway sidings and associated facilities for the running of the foundry, so sports could no longer be held there. Falkirk FC moved to Randyford on Grangemouth Road. The ground referred to above as Campfield was derelict wasteland when I was growing up, but now is largely taken up by the carpark of the Falkirk Central Retail Park. 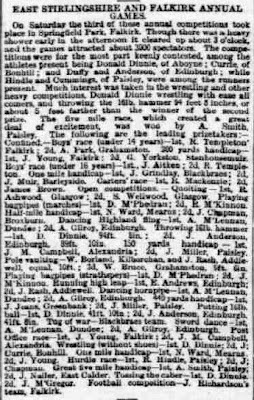 As a slight addition to my non-proof [but circumstantial evidence] I would add this report from the Glasgow Herald from June 1879. Herein the Falkirk & East Stirlingshire Annual Games are reported as having taken place in Springfield Park. Note the name of the foundry being built. 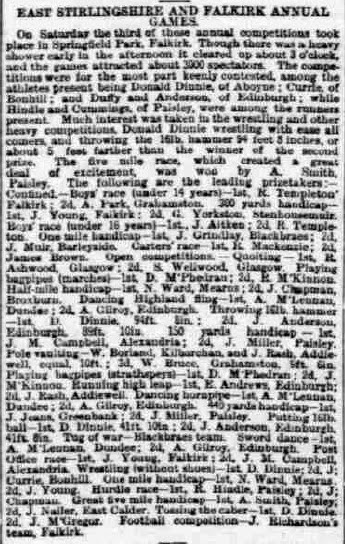 But of more interest to me is that J.Richardson's team won the Football Competition [it must be James Richardson of Falkirk FC, whose family home backed onto the land.